This afternoon my daughter and I met friends at the new Blue Heron Bay spray play facility at Independence Lake that opened this summer. It was our first visit to the new facility. 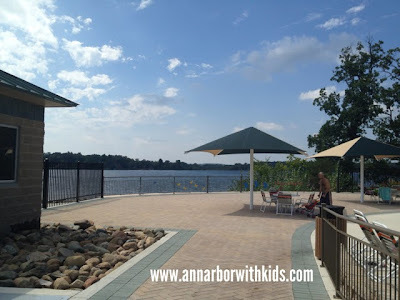 When I first heard about Blue Heron Bay at Independence Lake, I was excited because my daughter had not particularly liked the lake the first time we visited several years ago. Then I was disappointed to hear that it would have an admission charge above the vehicle admission fee. 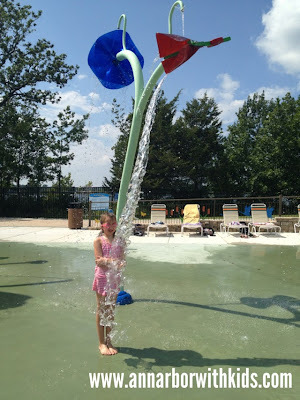 However after visiting, Blue Heron Bay is more than just a small spray ground. IMO it is definitely worth the price of admission. Independence Lake is a Washtenaw County Park located north of Ann Arbor at 3200 Jennings Rd in Whitmore Lake. 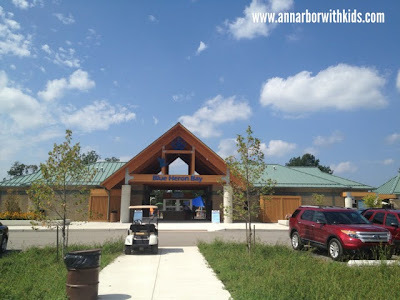 The park is located west of US-23 and can be accessed from either the North Territorial or Six Mile Rd exits on US 23. Daily vehicle admission to the park is $6 for county residents and $10 for non-residents. You can also purchase an annual vehicle pass for $30 (county resident)/$45 (non-resident) annual pass. Your annual vehicle pass is valid for both Independence Lake and Rolling Hills County Park. Since I had bought a pass this winter at Rolling Hills, we did not have to pay the vehicle admission fee. We arrived at Blue Heron Bay after lunch around 1:30p and paid our admission. Blue Heron Bay has and additional entry fee of $4 for county residents and $5 for non-residents. Children 2 and under are FREE. They also offer discounted admission after 5p on weekdays, $3 for county residents and $4 for non-residents. Blue Heron Bay is open from 11a-7p from Memorial Day through Labor Day. The main buildings houses bathrooms and family changing rooms to the left and the snack bar to the right. Blue Heron Bay has two spray scape sections and a slide tower. There are lounge chairs around the outside of the spray scapes with a few tables scattered about. There is also additional seating near the snack bar. Blue Heron Bay is located right on Independence Lake and offers a great view, particularly from the area near the slide tower. The view from the slide tower is even more stunning. I convinced my daughter to wait for the big slides until her friends arrived. While she waited, she posed for a few pictures for me. Her favorite pictures is the one below. She posed for a number of pictures under this water feature until I got one with the water dumping on her (and no other child in the picture). There were a number of spray jets from the ground, spray spouts, and other kid-level sprayers. They would cycle on and off, so if you weren’t paying attention you could be sprayed unexpectedly. Yes, this happened to me while I was taking photos. Fortunately I was holding my iPhone protectively in front of me so it stayed dry. While she was playing with her friends, they quickly developed a favorite dumping feature. It dumped into a series of bowls. You could leave the upper bowls until they overflowed or dump them. The kids loved dunking their head in the lowest bowl while their friends dumped the upper bowl on top of them. I wish I had pulled my phone back out for a picture. Once my daughter’s friends arrived, we headed to the slide tower. 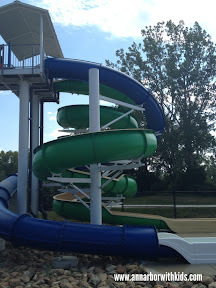 There are two slides, a blue pipe slide and a green half-pipe slide. 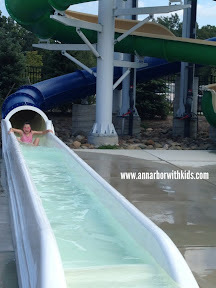 Both slides outlet into a chute instead of a pool. The slides have a height requirement of 42″. I waited at the bottom until my daughter rode both slides to catch her picture coming out of the slides before testing them for myself. The blue pipe slide is very fast, and the last curve is fairly sharp. While I was there I heard a few people say they banged their heads, a few people who flipped over, and I banged my knee coming out of the curve. I would say that it is one of the rougher slides that I have been on. The green slide is considerably slower, particularly if you sit up. I saw one boy who had to give himself a push to make it around the last curve. 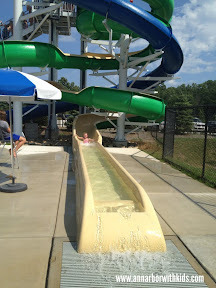 There is a lifeguard at both the top and bottom of the slide. The staff at the top makes sure that the slide is clear before the next person so there are no collisions. Blue Heron Bay offers typical pool like amenities rather than spray ground features. There are plentiful chairs and shade for lounging, snack bar, bathrooms and changing rooms. There are roughly 5 Family changing areas and 2 family bathrooms. I was a little disappointed that the Ladies room did not have dedicated changing areas or showers and instead we had to use one of the family changing rooms. When they are crowded, this is a definite disadvantage. I was able to snag 3 lounge chairs together for myself and the friends meeting us. I was pleased that many of the chairs were in the shade. My friend commented that it was easier to watch a group of kids here than at Rolling Hills. 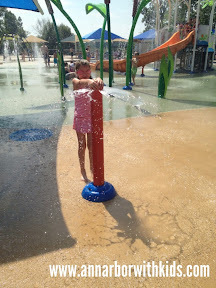 From our chairs we could see the kids on the spray scape and with a little neck craning at the slide tower. Unfortunately our seats started in the shade, but ended up in the sun by the time we left. The Snack Bar seemed to have a similar menu and prices to Rolling Hills – Burgers, Chicken Sandwiches, hot dogs, frozen yogurt, and Arctic Ice. Since we already had lunch plans today, we did not utilize the snack bar. It did not seem that crowded, however we arrived at 1:30 and may have missed the lunch rush. You can’t bring your own food inside the gate, however you can eat outside the gate or at the beach area. Our kids had a great time at Blue Heron Bay and want to come back. My daughter was disappointed to hear that she couldn’t return until next summer (we have plans this weekend). I asked my daughter to compare it to the Rolling Hills Water Park, and she prefers Rolling Hills because she can swim there. 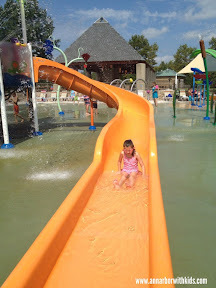 I asked her to compare it to the Plymouth Sprayscape that she visited earlier this summer and she said that she liked Blue Heron Bay better because it had the slides, although the Plymouth sprayscape had sand. I think next year we will try to make a day of it and include a trip to the beach area for sand and swimming.